With increased threats to sound health care and clean air policies, your voice is needed now more than ever. Health Professionals for Healthy Lungs (HPHL) is designed for health professionals across Illinois who share Respiratory Health Association’s vision of healthy lungs and clean air for all and want to lend their voices in support. 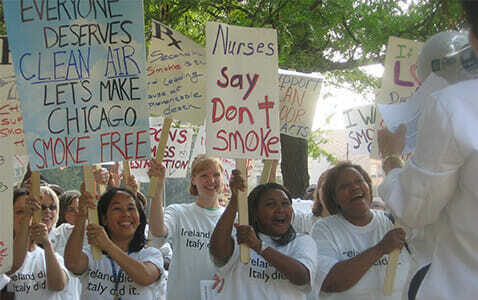 As we learned during the historic Smoke-free Chicago campaign in the early 2000s, health professionals bring additional authority and credibility to policy change efforts. By joining HPHL, you and fellow health colleagues are able to help influence today’s public health issues — from access to care and reimbursement rates to raising the tobacco purchase age to 21 — and public health policies of the future. Guided by health equity principles and committed to improving lung health in all communities, HPHL advocates for clean energy, healthy air, and policies that improve lung disease management and decrease exposure to tobacco products. HPHL members have 100% control over when and how they are involved. You will be contacted by email periodically throughout the year with information about a policy issue and asked to send an email, make a telephone call, submit a letter to the editor or join RHA at a legislative meeting. HPHL members are also invited to participate in events held to educate the news media and general public on issues of lung health. Most activities are quick and easy, and all of them have a big impact on RHA’s efforts to prevent lung disease, promote clean air and help people live better and healthier lives. Join HPHL today. For more information, contact Matt Maloney, Director of Health Policy, via email at [email protected] or by phone at (312) 628-0233.